A routine late-era John Wayne western, Big Jake tries to adjust to the cinematic times but defaults to an inconsistent mishmash of gore and camp. It's 1909, and the West is slowly modernizing with the arrival of automobiles and motorcycles. Nevertheless, lawlessness abounds, and a gang of nine thugs under the leadership of John Fain (Richard Boone) pillages the McCandles ranch, killing several people and kidnapping Little Jake (Ethan Wayne) for a $1 million ransom. Little Jake's grandmother Martha (Maureen O'Hara) survives the raid, and calls on her estranged husband Big Jake (John Wayne) to handle the ransom payment and free the young boy. Big Jake is a crusty frontiersman who walked out on the family years prior for vague reasons. He has an uneasy relationship with his sons, but nevertheless teams up with James (Patrick Wayne) and Michael (Christopher Mitchum). Along with Indian scout Sam (Bruce Cabot) they go after the kidnappers, who are lying in wait across the border in Mexico. With 1969's The Wild Bunch popularizing the death of the old west and redefining the allowable gore quotient in Westerns, John Wayne attempts to align his persona with the modern on-screen times. Big Jake features plenty of bright red squibs to simulate gun shots, and many references to the changing landscape, with civilization creeping in from the east. 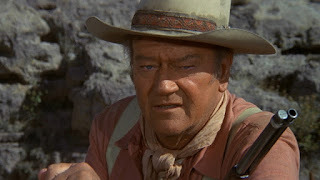 But a John Wayne western is also required to meet the expectations of long-time fans, and by 1971 this means an abundance of unnecessary slapstick, frequent superfluous fist fights, and a jerky tone as the unevenly applied visual violence sits uneasily next to more old fashioned sensibilities. At least Wayne is not beyond poking fun at himself. Jake's age, declining abilities and fading eyesight are frequent points of reference. He tries to use more brains than brawn to try and outsmart his younger opponents. Jake also meets his match and loses a bare knuckled fight, although that may be an intentional distraction. More disappointing is a trite story of pursuit and revenge, punctuated by unconvincing tension between Big Jake and his sons. The script is tired, with the dialogue exchanges often descending into the same macho posturing on a loop. The bad guys make key mistakes at critical times, never pull the trigger when they can, and always allow Jake and his sons time to weasel out of tight spots. The entire premise of the story is also suspect: a trunk containing $1 million is apparently right there at the McCandles ranch, and with minimal effort the Fain gang could have escaped with the cash rather than the kid. On the more positive side, director George Sherman, delivering his final film, captures impressive and satisfyingly rich vistas. The action sequences are adequate, and the final showdown is a reasonably enjoyable and prolonged climax featuring a mix of close up and long range combat. The supporting cast is filled with B-movie talent pushed by nepotism into prominent roles, Wayne's son Patrick and Robert Mitchum's son Christopher given more screen time than their talent deserves. 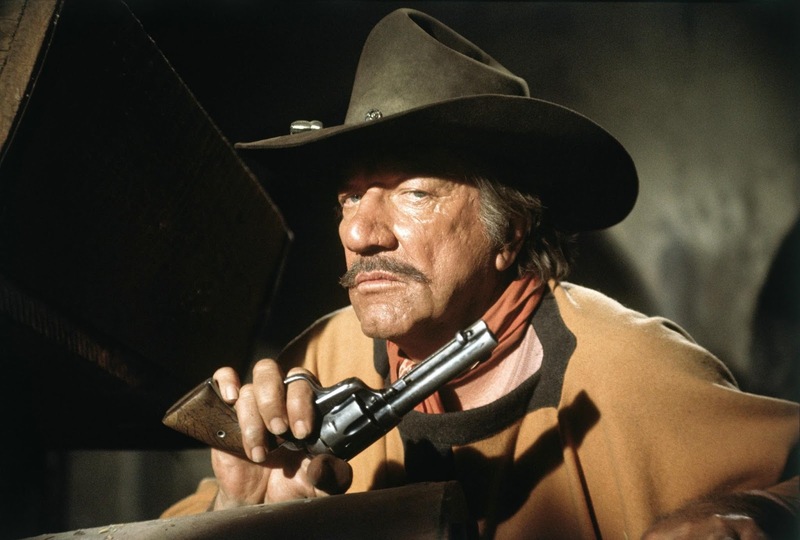 Richard Boone emerges as the one weighty presence, but he is underused. Maureen O'Hara only features in the opening 20 minutes or so, and Big Jake represents the last of her five on-screen teamings with Wayne. As the traditional west is erased by the sands of time, both the stars and partnerships of old fade into mediocre movies.